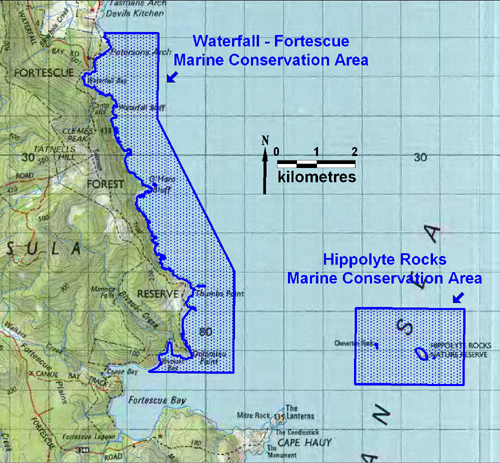 The Hippolyte Rocks Marine Conservation Area encompasses 534.9 hectares of waters surrounding the Hippolyte Rocks off the east coast of the Tasman Peninsula in the vicinity of Cape Hauy. The Hippolyte Rocks Marine Conservation Area contains near pristine habitats and ecosystems with high natural productivity, including a range of reef habitats, from exposed shallow reef to very deep reef beyond 100 m depth. The reserve contains pinnacles rising vertically from the deep offshore shelf, providing unique habitat for sessile invertebrate communities and soft corals, sponges and other animals. The deep shelf ecosystems, and reef habitats provide habitat for rock lobster (Jasus edwardsii) and various fish species, including striped trumpeter (Latris lineage), butterfly perch (Caesioperca lepidoptera), mackerel and morning. The Hippolyte Rocks contains a large seal haulout which provides a hunting ground for the vulnerable great white shark (Carcharodon carcharias). The abundant marine life in the area sustains significant breeding populations of short-tailed shearwaters (Puffinus tenuirostris), fairy prions (Pachyptila turtur), common diving-petrels (Pelecanoides urinatrix) and black-faced cormorants (Phalacrocorax fuscescens); all located on Hippolyte Rocks. The area is also significant for migratory birds and seabirds including albatrosses and petrels, and contains feeding grounds for Australasian gannets (Morus serrator), white-bellied sea eagles (Haliaeetus leucogaster), and little penguins (Eudyptula minor).